So here we are. Another year of eating. Funny how time flies. I know it is a total cliche, but really, I can remember last year's EAT! Vancouver vividly. Well, this year they've moved back into their familiar digs at BC Place where it is more spacious and some free parking can be found (which I did... Score!). And just like last year, I was lucky enough to have a media pass. I was able to get in a bit early and peruse the booths before the hoard of people were let in. As such, I wandered over to Kitchening with Carly where she had a nice display of her Macarons. If you've never tried them, they're much better than the ones found at Thierry. She passed me a salted caramel and it was a flavour explosion in my mouth - creamy, sweet, salty and buttery. As I was munching on the macaron, Carly pointed me in the d irection of Republica Coffee Roasters based out of Fort Langley. 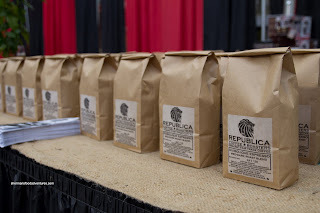 Okay, I'm not a huge coffee drinker, but after trying their Dark Roast, I was pretty happy. Despite being rich and full-bodied, it was super smooth and went down well without the need for cream nor sugar. After that, I met up with Sean and we wandered around until we figured it would be good to tackle the Bite of Vancouver. A total of 14 restaurants offer little bites in exchange for tickets. They are $10 for 20. 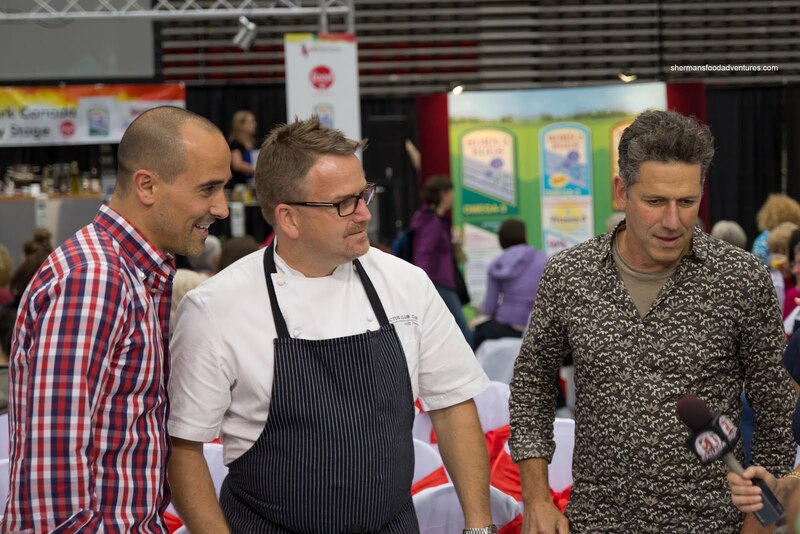 Before we starting attacking the food, we caught a glimpse of David Rocco, Rob Feenie and Bob Blumer being interviewed by Erin Cebula for ET Canada. 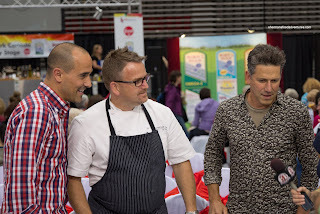 They were participating in the Celebrity Chef Throwdown (which was only for Friday). You can still catch Rob Feenie on Saturday and Dale MacKay on Saturday and Sunday. 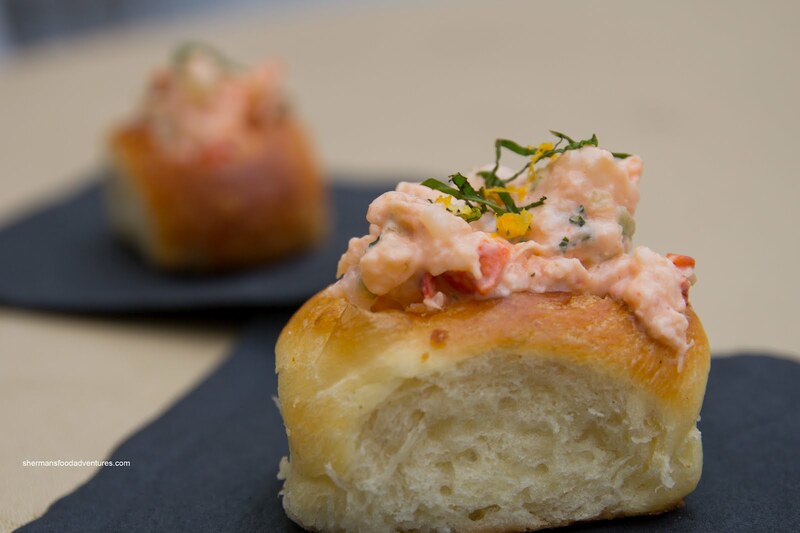 After taking the picture of the 3 celebrity chefs, we headed over to Glowbal Group booth where they were offering a few things including a Spot Prawn & Lobster Roll served in a mini-brioche. Too bad the brioche bun was stone cold, as it became quite dense and didn't compliment the filling. However, it is understandable under these conditions. It's not like they had full kitchen facilities... The filling was quite nice with plenty of crunch from the veggies as well as the seafood. 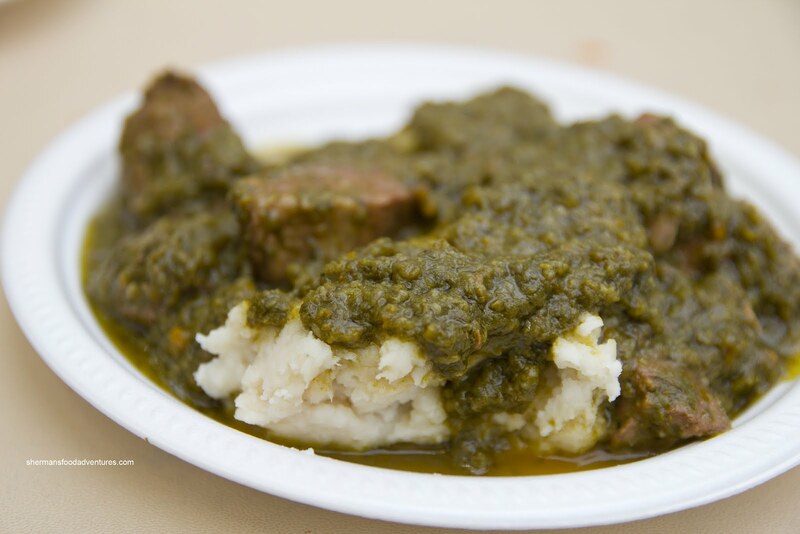 One item I was very anxious to try was the Lamb in Cilantro Sauce on navy bean puree from Mochikas. Yes, I'm not a huge fan of too much cilantro, but this just had an addictive smell. They were still setting up and the food wasn't as hot as it could've been. Hence, I was not able to enjoy this dish as much as I should have. The bean puree was rustic where it still had some texture while the lamb was fork-tender. The cilantro sauce was actually quite mild with a particular saltiness that resembled anchovies. Again, the dish was fine, too bad it was not hot. As a palate cleanser of sorts, I headed over to Bella Gelateria for some award-winning gelato (and sorbetto). 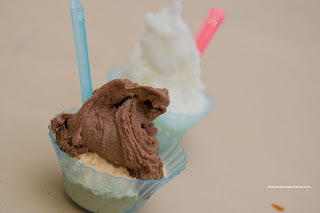 The cup in front consisted of Salted Caramel and Chocolate, while the cup in the back was Lemon Sorbetto. Suffice to say, I've said enough about the stuff from here, but yup, it's good. Flavours were intense and the textures, smooth. As we were looking at the stalls and trying to decide what to eat, we merely bypassed Establishment. However, the aroma of a soup stopped me in my tracks. 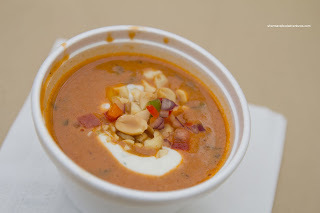 It was something definitely different - Chef Bongo's Famous African Chicken Peanut Soup. I gotta say that this was probably one of the best things we had from any of the vendors at EAT! Vancouver. The soup was thickened with yam rather than cream or a roux. Hence, it was relatively healthier, yet still rich and full-bodied. The peanut really came through in both flavour and texture where the peanuts added the necessary crunch. Finally, I used my last few tickets at the EBO Restaurant booth. It was a no-brainer really since they were making fresh roti. 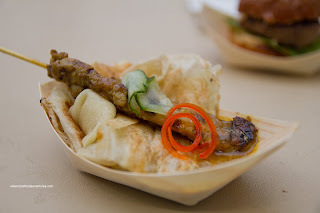 Much like at the restaurant, the Roti Canai was hand-stretched and made-to-order. It was served with a Chicken Satay Skewer and finished with sweet peanut curry sauce. I will put myself out there and say that the roti here is as good as any that I've had in Vancouver (including Malaysian restaurants). It is flaky and crisp on the outside while soft and fluffy on the inside. Combined with the flavourful dipping sauce, it is one of the highlights of the Sunday brunch at EBO. As for the chicken satay, it was moist and tender with just enough marinade on the outside. 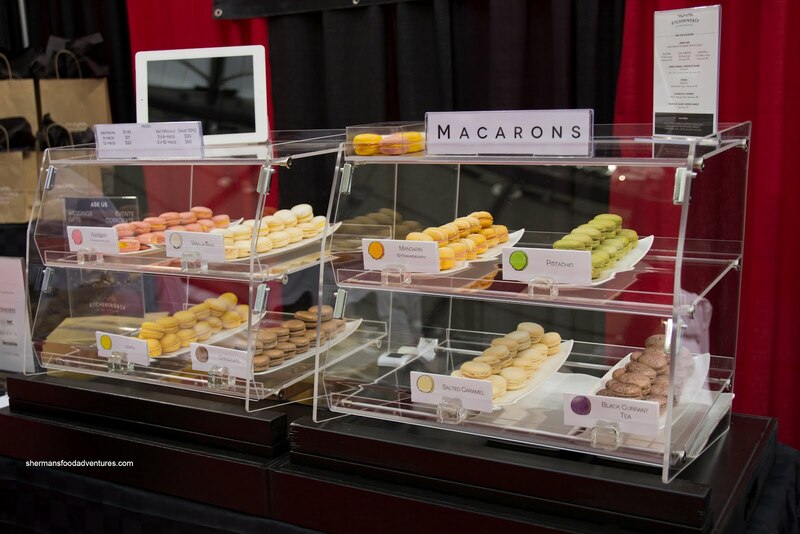 Hey, this is only a small sample of what there is to see and taste at EAT! Vancouver 2012. The show is on until Sunday. Check out their website for ticket and show information. I was tempted to go this year, but the high entrance fee deterred me. It sounds like they are going back to their roots of offering small bites instead of full meals, which is a good thing. I also hate the line ups for the free samples. Oh well, I'll have to satisfy my food cravings at the Hats Off celebration in Burnaby Heights today. Now, that's a real community event... I wonder what the Pear Tree will be offering? @Holly - we were there at the Hats Off celebration. After taking 20 mins before I finally found a parking spot (on Georgia @ MacDonald), and then finding my wife & kid (near Chez Meme Baguette, where I told them to wait for me), not long after that it began to rain. No ..... pelt. And the downpour didn't let up. We had to settle for lunch at that very meh Vietnamese place. We were quite disappointed we weren't able to walk & eat and discover the best the local merchants and restos have to offer.